Why trade in one exchange while you can trade all, with Equities account you are a one click away from 9 different Stock exchanges. Your limits are open as much as your internet connectivity on which you will have a free access to our award winning Web-Trader, On top of that you can use more advanced trading platforms through Desktop, Laptop, IPad, Android and IOS Mobiles for a minimal Subscriptions. Access to real time market movement and updates by following up on all listed securities with the ability to check the Level 2 Quotation. 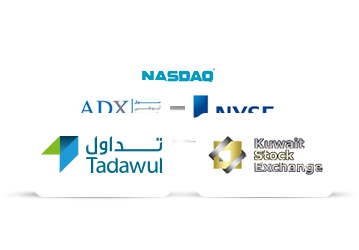 KSE real time data is connected to your account for Free, and you can access other regional and international Exchanges by subscribing through our amazing packages. Be on top of Corporate Actions and other Major News with the live news feed connected to the Account for free. Segregated cash accounts enables you to have more control and details over your trading actions among different Exchanges. Get SMS confirmation on each transaction you make, wither you buy, sell or modify your orders a confirmation will be delivered to your mobile instantly. Get an Extensive care by having a full account details within a click of a button, you can generate and view your account status and report to have full history of your actions. Are you a Technical analysis Enthusiast? With a Pro Subscription you will have the ultimate charting tool with the ability to use all available Indicators. Just build your own chart and act upon it. Our Trading-Desk operates from 8am – 12pm covering the working days of GCC and US Markets. If you are away from your account connection just Dial our Hotline number (965) 1886000.